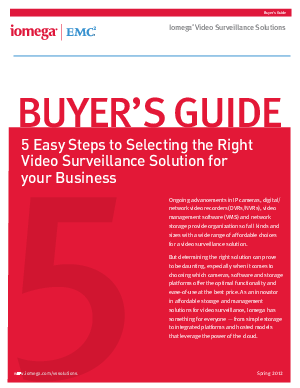 Ongoing advancements in IP cameras, digital/ network video recorders (DVRs/NVRs), video management software (VMS) and network storage provide organizations of all kinds and sizes with a wide range of affordable choices for a video surveillance solution. But determining the right solution can prove to be daunting, especially when it comes to choosing which cameras, software and storage platforms offer the optimal functionality and ease-of-use at the best price. As an innovator in affordable storage and management solutions for video surveillance, Iomega has something for everyone - from simple storage to integrated platforms and hosted models that leverage the power of the cloud.